One detail of the project that was particularly delightful to the owners was the creation of their own private bathroom. 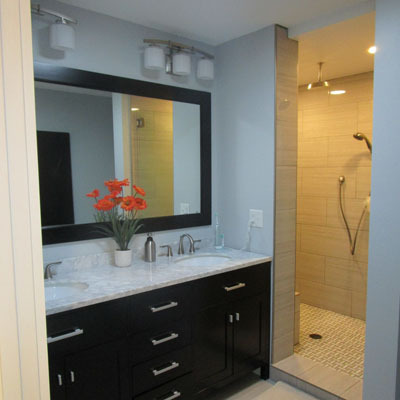 There was just enough interior space to carve out room for a large vanity and a generous double shower. The addition of a solotube (a reflective, lined tube from a roof-mounted dome to a fixture in the ceiling) in the bathroom means that even though the room is entirely internal and so has no windows, there is ample light to see during the day even without the light on.